What is the USC Colorguard? The USC Colorguard is a group of girls who perform regularly with the marching band. We perform flag and dance routines during halftime at football games. We also perform during the pregame show. We do four different shows per season. The halftime shows for the 2003-2004 season were a DCI tribute, Styx, a Southern Gospel/Dixieland tribute, and the annual patriotic/military recognition. Thanks to Kat, Kim, Nikki, Kasey, Michelle, Sabrina, Megan, Miranda, and Misti for writing the work for the this year's shows. The guard performs at all home games, and also certain away games. As a part of the band, the guard also goes on any trip to a bowl game. 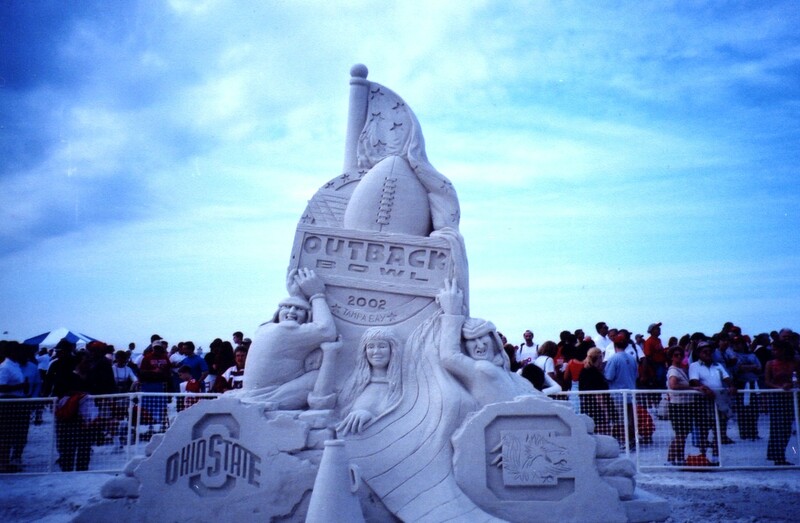 In both 2000 and 2001, we went to the Outback Bowl in Tampa, Florida. This year members of the colorguard also participated in Dance Marathon, a 24-hour event to raise money for Palmetto Children's Hospital in Columbia. We exist for two reasons. First, to provide good visual effects for the marching band. Second, to support the University of South Carolina football team. 2002-2003 captain, Kathryn Floor catches a toss.